Derelict sites, overgrown land and empty spaces can be found in every city. They stir the imagination and are an invitation to positive action. That is also what makes them prime locations for temporary or collective projects to emerge – gardens, petanque-courts, skate-parks, open-air cinema’s, you name it. From the first stroke of a spade it is clear however, that revitalising these spaces takes more than enthusiasm and a good idea. Is the land in public or private ownership? Why was it abandoned? Are there development plans for the site?… Dealing with these questions requires quite a bit of motivation and negotiation of red-tape, but whether for fun or conviction, people keep finding it worthwhile to take on derelict sites in their cities. In November 2010, City Mine(d) [www.citymined.org] gathered one hundred people from nineteen European cities who all agree on this very subject. The theme of their meeting was the ‘how and why’ of small initiatives, and its ‘headquarters’ were in Brussels’ European Quarter. Most visitors were familiar with the mix of levels of government in their own local area – from neighbourhood council to metropolitan, regional and national government – but exceptionally in the European Quarter, the European Institutions are also a local field actor. Two themes have emerged repeatedly throughout this whole process in the European Quarter: water in the city and participation in urban development. In 2012, backed by a wide variety of old and new initiatives PUM began laying out a Water Garden, experimenting with better ways to deal with water in the city. As part of New Urban Rivers, PUM also collects technical and scientific knowledge about water management in the nearby Leopold Park. Furthermore, the activities create a dialogue with different local authorities and challenge them to shape the city in a more inclusive and fair way. By means of an introduction and as a way to build upon a shared ‘real life’ experience, participants watch a short film1 about the neighbourhood and go for a walk through the neighbourhood. A member of the neighbourhood committee Association du Quartier Léopold [www.quartier-europeen.eu] leads this guided tour to initiate people in its local history and political and urban planning issues. The aim of the following MAP-it discussion is to come up with concrete proposals to improve the public space around the Leopold Park. 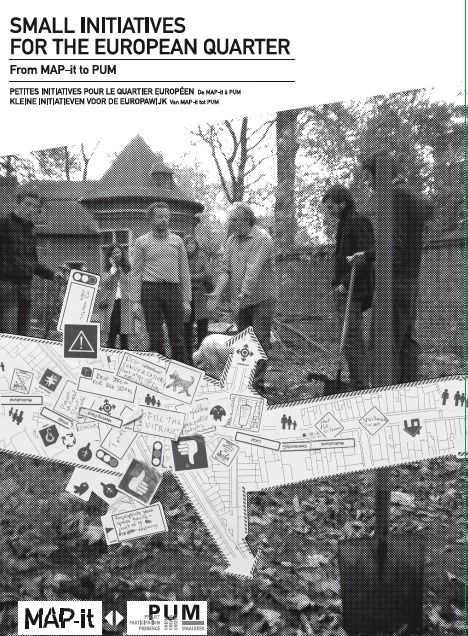 Equipped with a surface map of the European Parliament and the Leopold Park, stickers (both with icons and with empty fields) and a predetermined scenario, small groups of about 7 participants start the discussion. A moderator for each group keeps track of time and follows the scenario. Participants get sticker sheets (a different colour for each group), with logo’s and pictograms to answer each question on the map. Empty stickers allow for some leeway and for taking an occasional side step. 1 I Love EU – short film made by collectif Plus-Tôt-Te-Laat [PTTL] for PleinOPENair 2010, focussing on the security issues in the areas surrounding the buildings of the European Institutionsplaces that strike him/her potential for action or barriers that need to be overcome (amber light). Building upon this analysis, participants use their ‘goal’-stickers to identify 3 possible tracks to improve the neighbourhood. The most targeted ‘goal’ receives a ‘frame’-sticker. For this zone each group is invited to come up with new projects, actions or interventions explained by means of ‘person’ – and ‘action’-stickers. MAP-it European Quarter focusses on the urban area between Matonge (N), Jourdan (S), Chaussée de Wavre (W) and rue Belliard (E) with place Luxembourg, the European Parliament and the Leopold Park at its heart. After the first two MAP-it European Quarter sessions, the most important conclusion was that socially, functionally and aesthetically, the European Parliament and its adjacent buildings stand completely isolated from the rest of the neighbourhood. 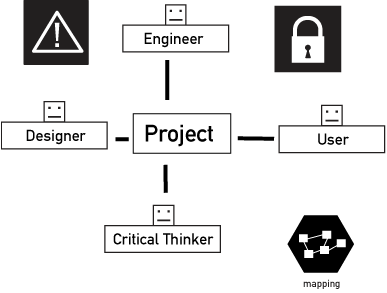 Security measures imposed by the European Institutions play a key structuring role which effects the surrounding public space and the siting of buildings. Its mono-functional character – empty and desolate in the evening – reflects badly upon the neighbourhood and creates physical barriers between the different parts of the area, leading to a severe lack of social public space. Several ideas have been raised to bridge this gap and to create new spaces for meeting and play. Temporary installations and arts interventions have been proposed to give the area a more informal character and to make it livelier. The high density and diversity of Matonge and Jourdan – in the periphery of the MAP-it map – could act as levers to develop concentric circles of population towards the over-secured Parliament and its Esplanade. Above all, there is a need for places where meeting and exchange can emerge organically. The Leopold Park and in particular the abandoned site at the foot of the Mediaeval Eggevoort tower could play a central role in this regard. New ways to integrate the fragmented neighbourhood, to remove barriers and to create new flows of people are also mentioned. Sign-posting of the entrances to the park could be improved, local activities could be better promoted and the relationships between different groups of people and places could be developed further. The windows of empty shops on the Chaussée de Wavre could play a part in this, or sign-posting could be re-considered altogether. The project-ideas and meeting of local actors as part of the MAP-it sessions are already a first step in this direction. 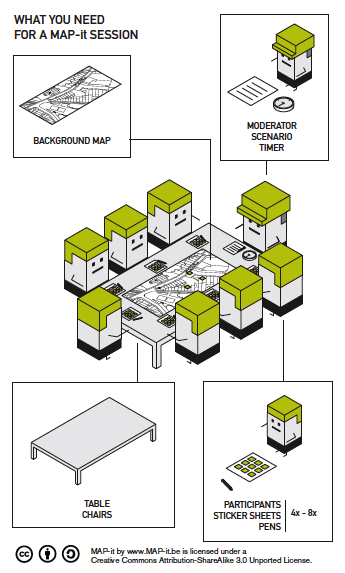 MAP-it provides a number of tools to facilitate discussions and to visualise interacting powers and preferences. The aim of the workshops is to generate new insights and initiatives by means of a participatory thought process. - sticker sheets with icons and empty fields: allowing participants to add their own analyses, comments and ideas to the background map. 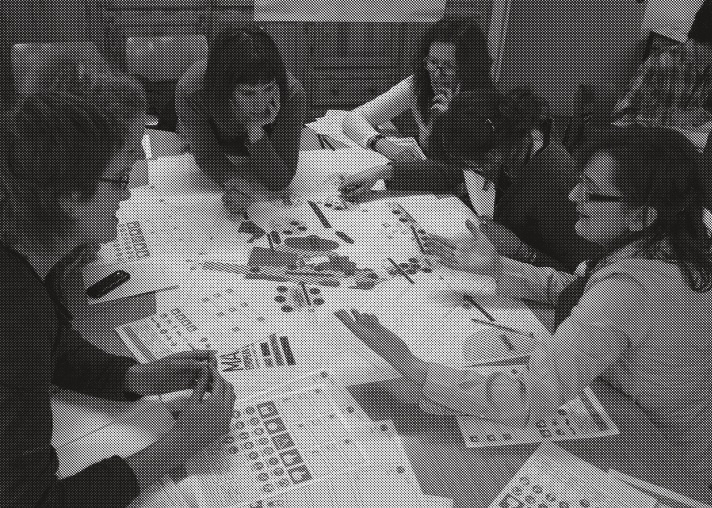 The interactive, adaptable toolkit-parts, the timed scenario and the visual character of the MAP-it process help to create a new and collaborative language. This allows dialogue and even collaboration among participants with different backgrounds and diverging opinions. MAP-it permet de faire l’analyse des projets passés et actuels sur un territoire et ainsi créer des activités futures. Cet outil s’adapte aux circonstances permettant aux participants de concrêtiser leurs pensées de manière visuelle sous forme d’une carte. Le caractère visuel de la cartographie permet aux participants de différents horizons de discuter de projets sur un pied d’égalité. De plus, la structure de la carte encourage non seulement le partage d’expérience positive mais aussi la critique et le débat. La communication est ouverte et des détails émergent grâce aux différents élèments du MAP-it. La première session du MAP-it Quartier Européen s’est déroulée lors de la Plate-forme urbaine organisée par City Mine(d) en novembre 2010. [FR] après l’atelier cartographie MAP-it du 2 mars dernier, les projets proposés sur les 3 cartes ont été regroupés de manière thématique (voir document en ligne). Comment les concrétiser, les réaliser ? 4 groupes de travail se sont penchés sur la question entre le 14 et le 21 avril. Lisez les comptes rendus ici. [NL] na de MAP-it cartografie van 2 maart hebben we de voorgestelde projecten per thema gegroepeerd (zie online document). Hoe maken we deze ideeën concreet, wie kan ze realiseren, …? 4 werkgroepen bogen zich over deze vraag tussen 14 en 21 april. Herlees hier de discussies. [FR] Pour cette édition, nous partirons du concept de « Nouvelles Rivières Urbaines » pour imaginer des projets concrets destinés à faire émerger de nouvelles pratiques pour la gestion de l’eau dans les territoires urbains. [NL] In deze MAP-it wordt de Europese wijk onder de loep genomen. Het is de bedoeling een serie concrete ingrepen te bedenken die de openbare ruimte rond het Leopoldspark kunnen verbeteren. Voor deze editie vertrekken we van het concept « Nieuwe Stadsrivieren » om een serie concrete ingrepen te bedenken rond nieuwe vormen van waterbeheer in de stad. [FR] A partir du travail réalisé par les groupes précédents, nous nous poserons les questions suivantes : 1. Comment faire pour que les travailleurs des institutions européennes et les riverains se rencontrent autrement? 2. Comment faire émerger de manière visible, vivante, ludique et respectueuse de l’environnement une autre présence des institutions européennes dans la ville? 3. Quels sont les projets concrets que nous pouvons imaginer afin d’améliorer l’espace public du quartier européen? [NL] We bouwen voort op het werk van de vorige groepen en vertrekken vanuit volgende vragen: 1. Hoe kunnen we meer ontmoetingen tussen de Europese instellingen, de Europese werknemers en de buurtbewoners creëren? 2. Via welke kleinschalige, concrete ingrepen kunnen we de openbare ruimte in de Europese wijk snel verbeteren? 3. Hoe kunnen de Europese instellingen op een zichtbare, levendige en milieuvriendelijke manier een plaats innemen in de stad?